Of all the amiibo currently available, Greninja is perhaps the most average. Its abilities aren’t particularly notable, and its strengths and weaknesses are in perfect balance with each other. Even so, average is good enough to work with. 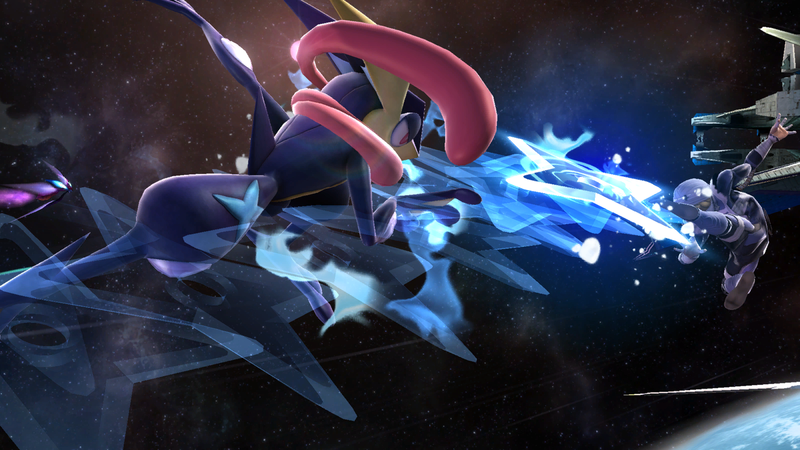 Among Greninja’s positive traits are its smash attacks: each one comes out fast and can KO most fighters by 140%. Its infinite jab is another one of its definite strengths, as it deals great damage and is difficult to escape. Greninja also possesses a fantastic projectile in Water Shuriken; its power and distance can be adjusted depending on how long the attack is charged. Its down special, Substitute, serves as a pseudo-counter that can turn the tide of battle in a pinch. However, Greninja is held back by several issues present in both its character design and AI. Its smash attacks do come out fast, but they suffer from heavy ending lag, making them punishable if missed. Greninja’s jab is the slowest non-tether grab in the game, and none of its throws bring any notable benefit to the character. Furthermore, the AI occasionally recovers too high; it may also use Shadow Sneak at close range. Both of these tendencies leave it vulnerable and give opponents a chance to strike. Greninja’s placement in the amiibo metagame is somewhat awkward, as it has no overwhelming strengths nor crippling weaknesses. That being said, training a champion Greninja amiibo is still a very realistic goal; that is, as long as it doesn’t lose the tournament to a Blast Burn from Mega Charizard X. Neutral options: jab, forward tilt, down tilt, and neutral special. 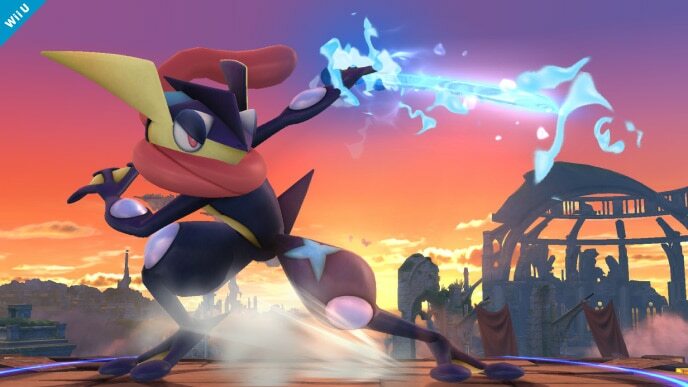 Greninja’s infinite jab is one of the most efficient available: it inflicts high damage and is difficult to escape, and serves as the character’s best damage-racking tool. Forward tilt is stronger but slower, and down tilt can link into a forward smash. When using Water Shuriken, use uncharged projectiles from a distance, and charged ones to edgeguard. Main KO moves: forward smash, up smash, and neutral special. Forward smash is Greninja’s most reliable KO option. It’s moderately fast, but has punishable ending lag. 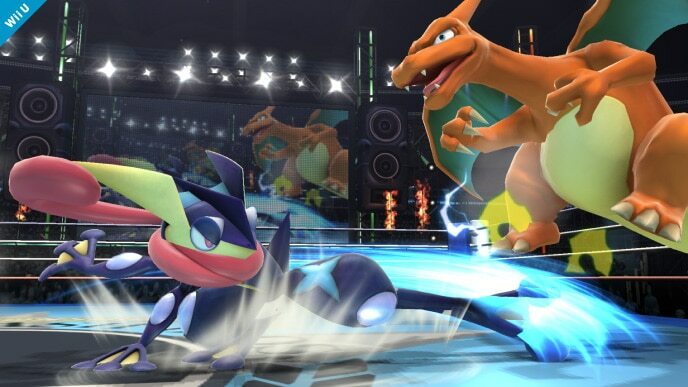 However, Greninja’s up smash is its strongest move when sweetspotted. Unfortunately, the sweetspot is difficult to land, relegating its use to an aerial punish. A fully-charged Water Shuriken also has decent KO potential near the edge. Situational moves: down special. 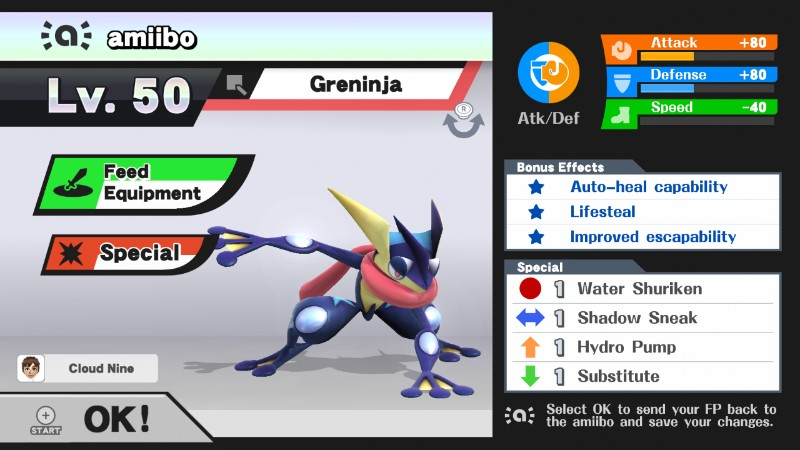 Greninja’s Substitute isn’t always effective due to its delayed reaction time, but it can be aimed in several directions to disorient opponents. The amiibo is extraordinarily accurate in its aim, so encouraging the use of Substitute is generally a good idea. Images are courtesy of SmashWiki and the official Super Smash Bros. website. The greninja amiibo is an interesting amiibo to train, i suggest putting at leastly half a month into it, try to jump as little as possible and really use that up throw to up air combo alot. It cant learn to hitstun cancel and it is very bad at aiming its up B to push recorvering enemies away from ledge, if you do add customs i strongly suggest keeping its speed stat the same. It never dashes, and even though his down taunt does damage, unlike luigi, he will never use it, ive killed him with it, i have edge gaurded with it, ive tried alot of things and none worked. He can learn to stage spike with back air but it takes alot of time and trainging to even get him to walk off stage ti get him in the position to were he can, if you attemp to teach him it only mirror match for the entire length of that process and recover by going as close to the stage as possible and up B straight up. If he does do it do not tech or attempt to recover so he sees it as a effective kill option, other wise he sees it as defective and it becomes practically impossible for him to finally try it again, but he will mostly run off stage as your heading toward it and forward air you. If he suicides with air nuetral off stage, dont panik, he rarly ever does it and usually never does it twice, ive only seen mine do it twice in well over a months worth of training, once on purpose to try and get damage and the second time was on a non omega stage and he attempted to hit someone on a platform but went straight past the platform to his death. He is great in 2v2 matches, but after a couple you need to mirror math him for a match or two and focus on walking and his tilts because he will get in tge habit of overly spamming up smash. He does have true combos contrary to belief, you just have to show him them. But he will up throw to up air, rarely, he usually worms his way into getting a fast falling up air sipke into jab or down tilt which i found really supring, if you utilize is down tilt, he will occasionally downt tilt to either jab, forward tilt, forward smash, or grab. Dont bother teaching him dash combos, he will never dash attack. Teach him to short hop fast fall air nuetral. He can combo with that but you have to teach him to fast fall air nuetral before lvl 50 or he will never get the hang of it, but even then he sometimes has a tough time. If he starts spamming aerials, just stay on the ground and focus on walking tilts smashes grabs and specials. Dont try giving him custom move, they arent really good and he will spam exploding attack. There is absolutly no way to teach him to not over recover with his up B, its one of his permanent flaw that are easy for people to exploit, but other amiibo dont punish it too iften but a few usually dont miss the chance. Dont worry about traing him to use his counter, he basically teaches himself. He is OK at 8 player smash but if you want to make him really good, pit him against 3 lvl 9 ganons at 99 stock and just wait till thats over but when you are done, you will need to fo some serious mirror matching but in 8 player smash you will notice that he starts to survive longer and adapt faster. In 2v2s he is great because you can through opponents into him and he usually gets the up smash. Use his back air alot aginst him in mirror match when ever he gets of stage and tries to recover over you by doing the dash reverse thing ( i forget what its called) and back airing so he learns to do that in close quarters when oppenents try to land aerials on him. As you can tell i know alot about him, he is my main and i am extremely good at him. He is a really good amiibo but you just have to work with him and re teach him things after a few matches because he begins to stray but after a while he it takes him longer and longer to stray till you only have to rarely mirror match with him to reteach. He is amazing at being passive aggresive and if you want him to use certain moves more often i suggest putting him on the same team as you against a lvl 1 dinkey kong with team damage off and you those moves alot or when the situations call for it. Sorry about the really bad spelling mistakes, I did all of this at 3 in the morning after a really long day. Hi there, your guides are really interesting I appreciate all the information you’re laying out. I’m an experienced smash player but I’m just getting into the amiibo meta game so I’ve just been playing around with what works and what doesn’t. However, I’d like to point out that I know maybe training with CPU may not be the best idea, but it might be worth while if you go into a match with a CPU and notice some nice simple combos they may pull like for example, since I’m commenting on the Greninja guide, I’d like to point out that the CPU character tends to string short combos with forward tilt. For example, D tilt to F tilt. I know Greninja’s grab is sluggish, but I’ve seen him combo with a D throw to F tilt as well. I’m still quite early in the learning process so correct me if you wish. Anyway keep up the great work! I’ll stay tuned in!